Rare Roman murals which were found underneath a London takeaway restaurant are being put on display. Dating from about 120AD, the murals found in Lime Street, central London, feature birds, vines and candelabra. 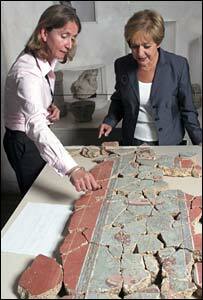 They will be displayed this weekend as part of the Museum of London's National Archaeology Week exhibition. Culture Minister Margaret Hodge said: "It is astounding that we are still discovering parts of Roman London under the pavements we walk every day." The murals, thought to have originated from a room in a high-status Roman building, have become part of the museum's collection of Roman painted wall plaster. Museum of London archaeologist Sophie Jackson said: "This is an amazing discovery because it allows us to reconstruct the decoration within a Roman London room from the early second century." The murals will be displayed at the central London museum from 21-22 July.